Manitoba is blessed with sunny, snowy winters and an incredible arts scene. So why not combine the two for some outdoor art shows that are super cool. 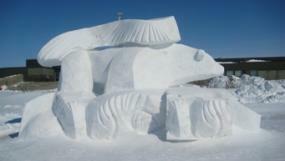 Right now at The Forks National Historic Site, 40 talented ice sculpting artists from the internationally acclaimed Harbin Ice Festival in China are creating epic ice sculptures, including life-sized dinosaurs and bears, a replica of the Manitoba Legislative Building (that also doubles as an ice slide! ), and beautiful frost-crystal sculptures. Not only is the show full of incredible ice sculptures, but it will also feature giant toboggan slides, ice bumper cars, and an ice bar. Opening day is January 25, so get your tickets today! What will this block of snow be transformed into? Head to Gimli to find out! This winter festival is all about that ice – racing on ice, fishing on ice, golfing on ice – and making art with ice. Cooley’s Ice Park is already taking shape as the large blocks of snow are ready to be transformed into sculptures which will celebrate Gimil’s fishing heritage and culture. The park is slated to be ready by mid-January and stay open until the festival March 5 and 6. In addition the snow sculptures, there will be a snow coaster and skating and walking trails throughout the harbour. Known as a giant party celebrating the Francophone and Métis heritage of the fur traders, this festival’s art attraction is its impressive snow sculptures. Artists come from around the world to sculpt giant blocks of snow into giant works of art for the International Snow Sculpting Symposium. This winter festival March 14 to 27 celebrates the culture of the north, including drumming, fiddling, jigging, and the art of working with snow and ice. 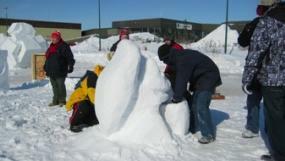 First, see the practical side of snow for building igloos, and then creative side of snow for building amazing sculptures. 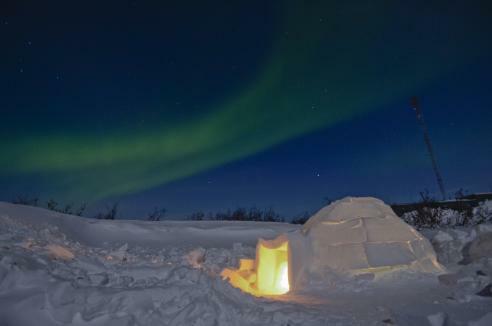 Plus, if you’re lucky, you can view these sculptures under one of Mother Nature’s most beautiful displays, the northern lights. These imaginative works that blend form with function will grace the frozen skating trail on the river at The Forks. The winners of this year’s design competition include a temple made of recycled materials, a reference to the barren trees that line prairie fields made from steel rebar, snow storytelling shelters featuring imprints of creatures from Manitoba’s north, plus a maze made of what else – ice! This pop-up restaurant is known for its unique design, and this year’s is designed by Manitoba firm Et Cetera Projects. The structure transforms from a horizontal frame on one end to a vertical frame on the other, and the dining space itself is a bit of a blank canvas letting the incredible food and the chefs preparing it, along with the good company of friends and strangers, take centre stage. And this show is going on the road – for the first time RAW: almond will appear somewhere other than The Forks with a three night stint in Churchill (March 1-3) thanks to a partnership with Frontiers North Adventures and Parks Canada. The structure in Churchill – set up inside the walls of the Fort Prince of Wales – will be different than the Winnipeg version, including transparent panels that let diners watch the northern lights. While Winnipeg’s RAW: almond is sold out (walk-up tickets for brunch will be available for the weekends between Jan. 30 and Feb. 14), ticket information for the Churchill edition will be released soon. Have a hot tip on where to find some ice cold art? Let us know in the comments below.